The Monetary Board of the Central Bank has promoted Assistant Governor, S. Lankathilake to the post of Deputy Governor of the Central Bank of Sri Lanka (CBSL) . Lankathilake has over 30 years of experience in the CBSL in the areas of economic and price stability, financial system stability and agency functions. He has held the position of Assistant Governor in-charge of Bank Supervision, Supervision of Non-Bank Financial Institutions and Financial Sector Research Departments and the Financial Intelligence Unit. Social media giant Facebook said that profits more than doubled in the fourth quarter of 2015. Net profit for the three months to December rose to $1.56 bn (£1.09 bn), up from $701 m.
The company also said that 80% of its advertising revenue came from mobile advertising, up from 69% a year earlier. The Institute of Policy Studies of Sri Lanka (IPS) will hold a Lecture on ‘Global Production Sharing: Implications for Trade and Investment’ by Prof. Premachandra Athukorala on February 3, at 3 p.m. at the IPS auditorium. The lecture will focus on areas of concern on the country’s current trade and investment policy. Prof. Athukorala is Professor of Economics, Division of Economics, Research School of Pacific and Asian Studies, at the Australian National University. He specialises in the economics of development with a focus on international capital mobility and financial crises, structural adjustments and stabilisation reforms, determinants of economics growth, multinational enterprises and international production, patterns and determinants of trade flows, and international labour migration. 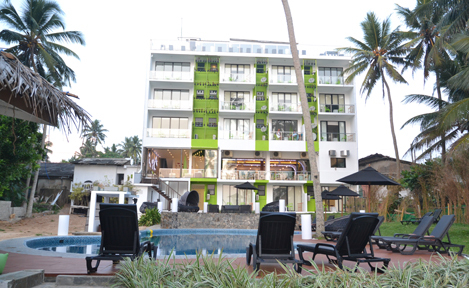 The Hirdaramani Group opened a apparel factory in Puthukudiyiruppu, Mullaitivu last week. The state-of-the-art apparel manufacturing facility is the Hirdaramani’s Group’s second investment in the North and the factory is expected to be LEED certified by the end of the year. Having launched initial operations in March 2015, the factory has now become a source of employment for approximately 1,000 people. By providing community members with a variety of job opportunities, the factory has been instrumental in supporting the recovery and development of Mullaitivu – the district that was most adversely affected by the civil war, which ended in 2009. 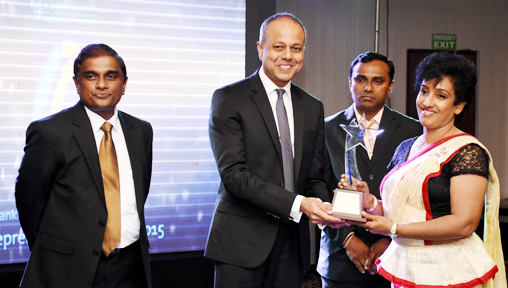 Lankaputhra Development Bank (LDB) held its first ‘Entrepreneur Recognition Awards’ in Colombo recently. 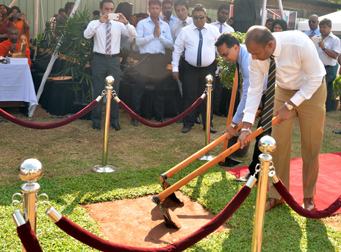 Minister of Law and Order and Southern Development Sagala Ratnayake and Deputy Minister of Public Enterprise Development, Eran Wickramaratne were the chief guests. Minister Ratnayake said, “These award ceremonies play an important role in motivating entrepreneurs to strive for better performance in their business ventures. The vision of the Government is to improve Small and Medium-sized Enterprises (SME) and bring them to the national level.” Here H.M.D. Champika who won the Best Entrepreneur award in the ‘Large-scale Industries’ category for her orchids and gerbera flower venture, receives the award from Minister Ratnayake. LDB Chairman Lasantha Gunawardene looks on. Baurs Chairman Daetwyler presents the cheque. A. Baur & Co (Pvt) Ltd., Chairman Thomas Daetwyler and CEO Lakshman Niyangoda made a donation to Prof. M.W. Moonwicha of the Ban Dek Ramindra School (Christian Foundation for the Blind in Thailand under the patronage of the King of Thailand) during their recent visit to Bangkok to launch a project funded by Baur Foundation. 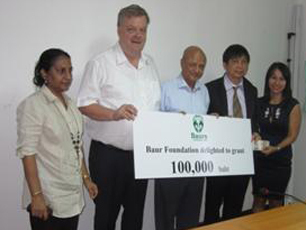 Baurs is the oldest Swiss organization in Sri Lanka and is involved in charitable activities funded by the Baur Foundation.